China’s third-quarter GDP growth report is chock full of contradictions. Though the 7.8% year-on-year growth rate was only the second in the past 10 quarters to represent a pick up in the pace of growth from the previous quarter, that was largely because of investment spending. A slowing of the growth in factory output and retail sales, along with September’s exports fall suggests there is little sustainable momentum to the economy’s recovery. With inflation hitting a seven month high, policymakers are more likely than not to rein in the credit growth that has accompanied the investment spending, a further potential brake on growth. More broadly, the economy has to be switched away from its reliance on investment spending and exports to generate growth and towards domestic consumption. That implies a long-term slowing of growth. Yet government spending accounted for an estimated quarter of all infrastructure spending in the first nine months of this year, against a more typical 15-20%. As this Bystander has noted before, for all the good intentions over rebalancing, the old habits of goosing the economy when growth slows are dying hard. The third-quarter number may serve to boost the annual GDP average so it clears the official annual targets. Growth for the first nine months of this year is 7.7%, against a full-year target of 7.5%. Yet its latest quarterly rise does not necessarily signal that the economy is moving in the right direction for the long term. Avuncular Uncle Wen is always the man to send to uplift spirits and spread reassurance when natural disaster strikes or times are trying. This week, China’s prime minister has been dispatched to his home turf, the economy, which has just reported its seventh consecutive quarter of slowing year-on-year GDP growth at 7.4% in the third quarter. And he is at his most upbeat. He says the slowdown has stabilized, and the official target of 7.5% annual growth for the full year will be achieved. When it was first announced in March that target seemed a ridiculous low-ball of a number, one that would be easily exceeded so that the outgoing leadership could hand over to their successors on a high note, at least as far as the economy went, and particularly in comparison with the ailing developed economies. But the managed slowdown in domestic investment, aka deflating the property bubble and stopping the local government debt bomb from exploding, has been exacerbated by the drop in demand from China’s export markets, and especially from its largest, crisis-wracked Europe. Policymakers have had to walk a fine line between stimulating the economy sufficiently to prevent growth slipping irrecoverably below the official target and reigniting the inflation they struggled so long to bring down. At the same time, they had to avoid inadvertently lighting any fuses close to the banks’ loan books. Yet Wen is all public cheer: “Exports have gradually recovered, consumption has grown steadily, price inflation has clearly receded, the job market has been very good,” he said in a statement published just ahead of the announcement of the third-quarter GDP number. There are monthly numbers to back him up. Exports rose 9.9% year-on-year in September, while inflation dipped to 1.9%, well down from last year’s peak of 6.5%. Retail sales were up 14.2%. This Bystander is always wary that one month’s number is no guarantee of the performance of the next one, though we don’t doubt that the 7.5% growth target for the year will be met, by hook or by crook. But Wen looks likely to over-deliver by as little as it is now clear he under-promised. Wen also pointed out in his statement that the government “had taken new steps towards structural transformation.” As to whether he has pushed the economy fast enough down the road to rebalancing and far enough so his successors won’t turn back, we’ll leave for another day. 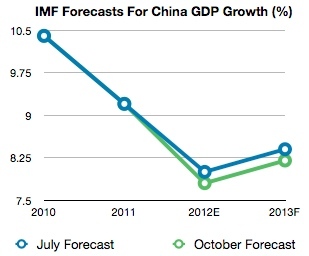 The World Bank and the OECD have already cut their growth forecasts for China for this year. Now comes the IMF. In its latest World Economic Outlook it says its expects China’s growth to be 7.8% this year, down from the 8% it expected in July (see chart, right). That would be the weakest growth in more than a decade. The IMF does see growth picking up to 8.2% next year, though it had previously expected 8.4%. Achieving any pick-up will probably depend more on what policy makers in Europe and the U.S. do than those in Beijing. If the euro zone crisis worsens and the U.S. falls off its fiscal cliff, matching this year’s growth will be a challenge in itself. “The balance of risks to the near-term growth outlook is tilted to the downside,” the Fund says. Beijing is being cautious in its policy response to the slowdown, providing moderate monetary and fiscal stimulus. The massive spending spree after the 2008 global financial crisis still hasn’t played itself out. Another round of extensive bank-financed infrastructure spending is just too risky for still strained bank balance sheets. Nor is investment-driven growth sustainable if Beijing is serious about rebalancing the economy towards more domestic demand. How Near To The Bottom? The long-awaited sign that China’s economic slowdown has finally bottomed out, or just another step towards that trough? HSBC’s Flash China manufacturing purchasing managers’ index (PMI) stabilised in September, ticking up to 47.8 from its nine-month low in August of 47.6. There was also a broad steadying across the sub-indexes, though the one that measures output fell to its lowest level in 10 months. The numbers are still on the contraction side of the 50 mark that separates contraction from expansion. The overall index shows that new business remains sluggish and the running down of inventories is taking longer than might have been expected. Stimulus measures – tax and interest rate cuts, expanded bank lending and liquidity injections and a green light for bringing forward $150 billion in infrastructure investment — may be taking effect, but gradually. Inflation showed signs of reviving in August, after hitting a 30-month low in July. Policy makers will be wary of taking further stimulative measures unless they absolutely have to. HSBC’s Flash PMI lets them hold fire for another month. It doesn’t seem that the Hu-Wen leadership will get to handover to their successors an economy that has put slowing growth behind it. The hit the global economy has taken from the eurocrisis has hurt China’s vast manufacturing industry harder and longer than expected. It now looks as if the slowdown in growth will last well into the third quarter, possibly beyond. Both the official and the unofficial HSBC purchasing managers’ indices for August were bad news in that regard. The official index fell below the 50 mark dividing expansion from contraction for the first time since last November. HSBC’s version, which reflects more small and medium sized firms than the official index and already below 50, hit its lowest point since March 2009. Talk of further policy measures to boost growth has intensified. Two interest rate cuts and central bank injections of liquidity via large-scale reverse repos have not had the hoped-for impact. As central bankers in the U.S. and Europe have found, it is not the price or availability of money that is the drag on recovery, it is lack of demand. China’s policymakers remain wary of aggressive easing and stimulus via infrastructure spending for fear of rekindling inflation and the property bubble that they worked so hard to reduce. The debt overhang from the last round of stimulus, after the 2008 global financial crisis, casts a dark and deeply concerning cloud over policymakers. This Bystander still thinks they will remain cautious about further easing, hoping that they will be able to get though the year with better than the 7.5% GDP growth that was set as the annual target, all be it by the skin of their teeth. That they were intending to pass on a plumper cushion of growth while setting expectations the longer term structural slowing of the economy will be conveniently forgotten for the moment. The World Bank has raised its forecast for growth in China this year to 9.1%. In March the bank had forecast 9.0% GDP growth. But it sees growth slowing next year to 8.4% against the background of a slowing global economy. That will also put the brakes on regional growth already hit by the flooding in Thailand that has disrupted manufacturing supply chains. In its semi-annual regional economic outlook, the bank highlights the Chinese economy’s vulnerabilities to the debt crisis in Europe and the heavy endebtedness of local governments at home, which it says may be exacerbated by the central government’s success so far in dampening the property bubble. “Policymakers will need to walk a fine line guarding against the short-term risks to growth and the lingering vulnerabilities associated with a still buoyant, if not overheated, economy,” the bank says. It also notes that the moderation in inflation gives policymakers scope to manage a soft landing by loosening their monetary tightening. The bank also says that the slowdown in global growth provides an opportunity for governments to refocus on reforms that will boost growth in the medium- and long-term, including investment to increase productivity and move toward higher value-added production, a task it calls “urgent” for China’s coastal manufacturers. In a clear nod to Beijing, it also says that where investment levels are already high, increasing the quality and efficiency of these investments should be the first priority alongside rebalancing growth towards domestic consumption. To drive ahead the structural changes in China’s economy, the bank repeats its calls for Beijing to focus on completing the transition to a market-based economy and strengthen the national innovation system. The China-specific part of the outlook is here. China’s trade deficit for February is an anomaly caused by the New Year holiday. This set of trade figures is even more meaningless for interpretation of a trend than a single month’s numbers usually are. If one looks at the trade figures for January and February combined, exports were up 21.3% and imports 36% on the same period a year earlier, compared with 17.9% and 25.6% in December. Rising commodity prices are inflating the export number, but the arc of the trend is for a gradually diminishing surplus on a rising volume of trade.